The name Talking Waters is derived from the continuous different sounds made by the Toccoa River, just steps from the cabin. The sounds are so sweet it is like a whisper of relaxation enters your sould just by listening. This Toccoa River cabin rental in Blue Ridge, Georgia is in a prime location, for both water enthusiasts and privacy. The Toccoa River is one of the most stocked trout fisheries in the North Georgia area, and Fannin County, GA is also the Trout Capital of Georgia. The Toccoa River is known all around as one of the best trout waters in the Southeastern United States. While at Talking Waters you have just about a two minute walk to access the United States National Forest, providing excellent trail hiking, hunting opportunities, and also pristine fishing from land that cannot be accessed just by anyone. The cabin itself, is a North Georgia Waterfront Cabin Rental dream, inside there is a gas log fireplace, fully stocked kitchen to cook those yummy fresh caught trout, two bedrooms, two bathrooms, and a sleeping loft with two twin beds. Each sleeping area has direct access to a covered porch directly overlooking the river. Each bedroom has a private door to the porches, so sleeping at night with the door open listening to the peaceful sound is no problem at all. The cozy living room with fire place is just the perfect spot for evening relaxation. 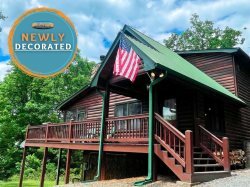 Also, the location of this Blue Ridge Mountain river front cabin allows you to be in several different attractions all in less than 15 minutes. The charming downtown area of Blue Ridge, Georgia has wonderful, locally owned restaurants, unique shopping, and many wonderful sites to see. Also, within a short drive of the cabin would be several waterfall hiking trails, thru the National Forest. Also, there are several places that you can do your own tubing and get out right at your cabins door step. Other popular to-do's at the cabin are outdoor activities such as roasting marshmallows over the fire pit, grilling meals on the gas grill, take a soak in the hot tub over looking the river, and just relaxing on the porch reading a book while listening to the river. Take advantage of your next get away at Talking Waters. Every one I have encountered are knowledgeable,helpful and as friendly as they can be! Have stayed many times and have always had a good experience! We had a great time! Grandkids loved the fishing opportunities. The sound of the river was so relaxing. Everything was very nice. Hated to leave. The Georgia Mountain Cabins team were easy to work with and friendly. They welcomed us when we picked up the keys, etc. and strived to meet our needs. Efficient check in process. Thanks! This is a nice property, we have four adults and two under 8 children. The house was comfortable and close to the river (outside the rear door close). Even though the weather was not cooperating, we all had a good time. The Hot Tub was good and the kids were very happy with it. The beds were comfortable with plenty of pillows, blankets, etc. that might be required. The area surrounding the cabin was good. We would rent this cabin again. Friendly and professional staff. Very simple and efficient check-in and check-out. An excellent house for people who like wading and swimming in a river. The center of the river is strong and deep enough to act as a swimming treadmill, with calm and shallow areas near the shore. Everyone was always so friendly and helpful. Offered to help in any way. Loved being right on the river! Paul was great. Gave us all information needed it promptly. It was our first experience in a cabin and everything was as promised. It was the first time in the mountains and staying at TALKING WATERS was an excellent choice. The dogs and family loved the area and the river. The cabin was clean and well taken care of. It was a nice relaxing weekend! We definitely recommend. I will definitely recommend TALKING WATERS to anyone. The cabin is very charming and everything was well taken care of. The sound of the river felt so good. Our stay was just what we needed.....peaceful and relaxing. The screened in porch areas were awesome and I spent a lot of time out there reading. The beds were very comfortable and having a washer and dryer was very convenient. We used the hot tub, the grill, the firepit - it was all amazing. Great service and help! Always have enjoyed staying with your company! Good prices and beautiful cabins! Just enjoy coming to Blue Ridge and getting away from the hustle and bustle of work. Love being able to sit on the back porch and just watch the river and listen to the sounds of nature! Also being able to sit in the hot tub and watch the river! We enjoyed working with your team and they were all very friendly and professional. It was a great break from the city for our family. With access to the river, it provided a great experience to catch trout and float the Toccoa a few steps from the back porch! Everyone was kind, gracious and helpful. Thank you! You made our vacation a pleasure, thank you! Nothing but good things to say about GMCR. Awesome, friendly staff and a nice selection of properties. We're repeat customers for a reason. Great job, y'all! Easy booking. Great cabin! Great overall experience ! Staff very friendly on the phone and at the office. Will definitely stay with Georgia Mountain Cabin rentals again ! This property is all about location, the view, and the great outdoors. Fantastic view from almost every room and the decks are great for sitting and relaxing, eating, fishing, reading and of course enjoying the hot tub. The outdoor fire ring was perfect for the cool weather. The beds are very comfortable. Your company has always been a pleasure to deal with. We look forward each year to visiting Blue Ridge and Talking Waters. The cabin was wonderful. The only problem we had was finding the cabin the sign was not easly found in the rain and when we did see it it was past the driveway.